This is an article recently published in the Astronomy Education Review, a publication of the American Astronomical Society (the published article is available here). 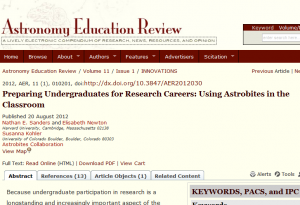 We discuss how the Astrobites website can be used in the classroom to introduce undergraduate students to modern research practices and findings. We outline strategies that educators can use to integrate Astrobites into their curriculum, such as inviting students to write their own research paper summaries or by using the Astrobites website as a forum for discussing methods and new results. If you’re an educator, we hope you will find these strategies useful, and we welcome your feedback.